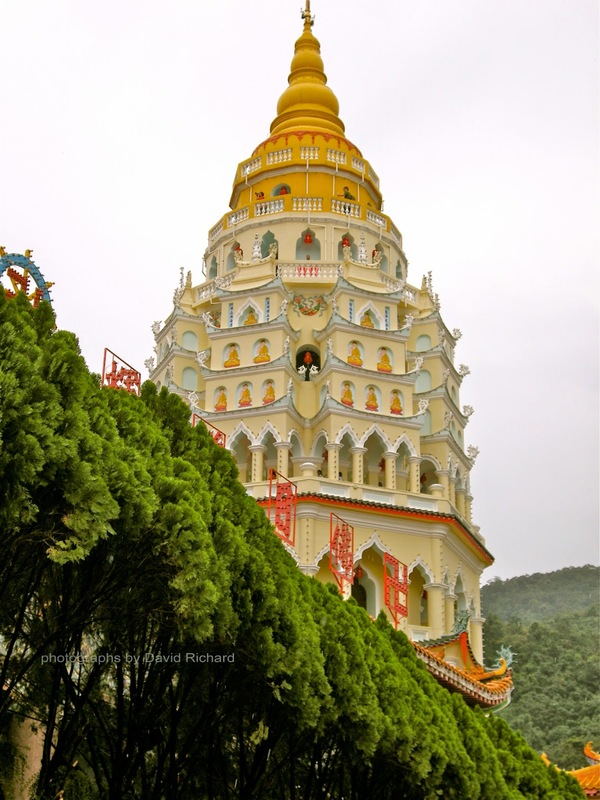 Any visit to Penang would not be complete if you did not visit the world famous Buddhist Temple of “Supreme bliss” or more commonly known as the Kek Lok SI temple in Ayer itam. It is one on the most popular temples in Penang and is also considered to be the largest in South East Asia. It is not one building but rather a collection of buildings that have been added on, as the years go by. Construction of the original temple started in 1890 and was inspired by the chief monk of the Goddess of Mercy Temple at Pitt Street. Such was the renown of Kek Lok Si that it even gained the imperial sanction of the Manchu Emperor Kwang Xi who presented the temple with a set of 70,000 volumes of the Imperial Edition of the Buddhist Sutras, the Emperor's hand-written scripts, and several other relics. The inscription in Chinese calligraphy “Ta Seong Pao Dian” on a plaque was written by His Majesty, Emperor Kuang Xi of the Ching Dynasty and was presented to the first chief Abbot of Kek Lok Si in 1904. Even well known Empress Cixi of the Ching Dynasty also wrote and presented hand-written scripts to the temple. Today, these priceless heritage relics still exist in the temple archives. The funds for the Temple construction came from the local devotees and five main donors. Kuan Yin and the elebroate carved shelter. In 1930, the seven storey main pagoda of the temple or the Pagoda of 10,000 Buddhas, was completed. The design of this pagoda is very unique as it combines a Chinese octagonal base with a middle tier of Thai design and a Burmese crown, reflecting the temple's embrace of both Mahayana and Theravada Buddhism. Another unique feature of the temple is the very large bronze statue of the Kuan Yin (30.2m) that was completed and opened to public in 2002. It replaced the previous white plaster Kuan Yin statue that was damaged due to a fire a few years earlier. The bronze statue is located on the hillside above the pagoda while the head of the previous statue, which survived the fire, is preserved and placed on the right hand corner of the new statue. As the fairly recent date mentioned above may suggest, the temple is still growing. Generous donations from the affluent Chinese community allow the construction of additional buildings. 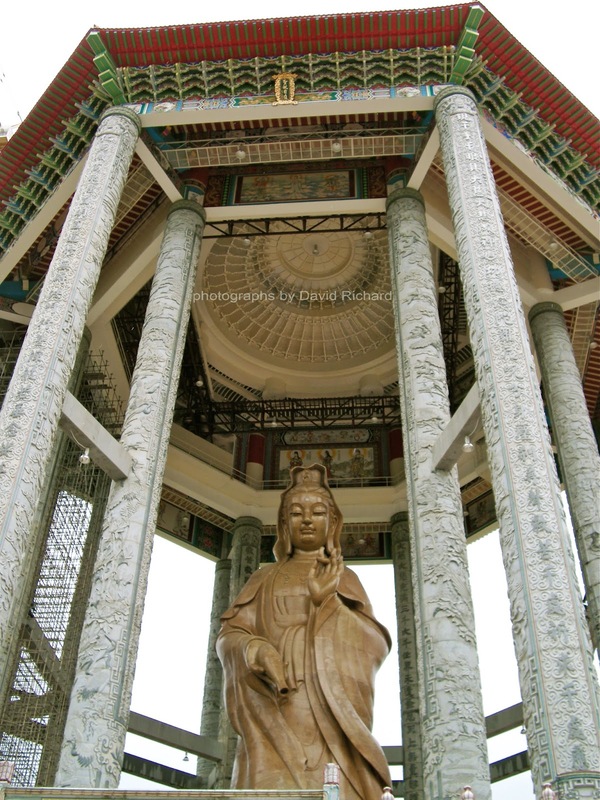 From 2005 to 2009 an ornate shelter for the Kuan Yin statue was constructed of carved dragon pillars, crowned with a 3-layered concentric octagonal roof. Visitors to the temple usually take the stairs from the bottom of the street which winds it way up the hill to the Temple. Along both sides of the staircase, hawkers have set up stalls selling all sorts of souvenirs, food and drinks. The temple itself consists of several large halls for assembly and prayer, and various statues of Buddha, various Bodhisattvas as well as Chinese gods are venerated. Intricate woodwork, often brightly painted and a plethora of lanterns add to the visual impression. There is an inclined lift to carry pilgrims and visitors further uphill the towering statue of Kuan Yin, Goddess of Mercy, which can also be regarded as Avalokitheshvara, Bodhisattva of Universal Compassion. 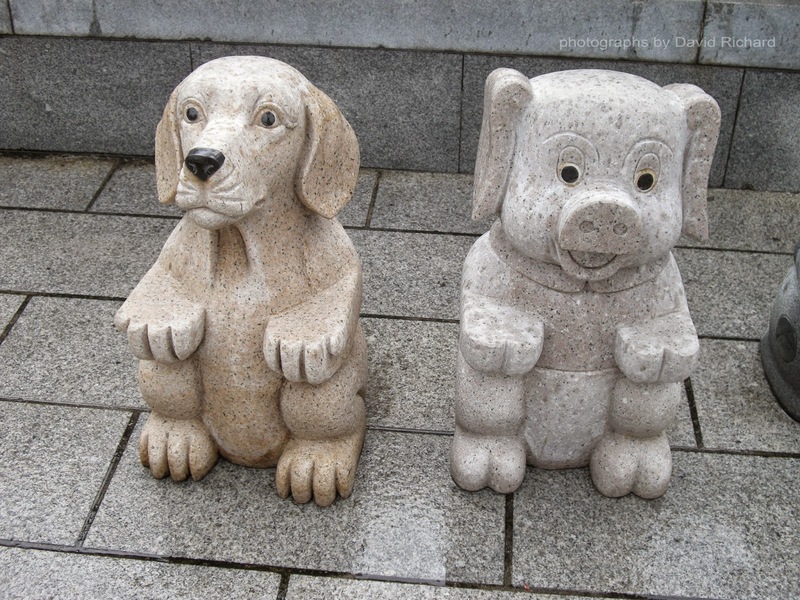 Placed around the Statue are carved statues of the various animals’ of the Chinese Zodiac. Animals from the Chinese Zodiac. The temple is a focal point of festivals of the Chinese community in Penang. The Chinese New Year celebrations are particularly impressive. For 30 days following Chinese New Year, the temple remains open until late at night whilst thousands of lights turn the scenery into a sea of light. Entrance is free. However a RM2.00 is charged for entrance to the Main Pagoda and also the Inclined lift up to the Statue.